Disconnected youth are teenagers and young adults who are between the ages of 16 and 24 who are neither working nor in school. This population is also known as “Opportunity Youth” because of the positive economic impact when youth are supported on pathways to self-sufficiency. Because the population is heterogeneous, no one program or approach will be appropriate for all. The Children’s Cabinet will take a collective impact approach to aligning interventions, policies, and programming to promote a robust ecosystem of opportunities. Nationwide more than 5.6 million young people are disconnected, about one in seven. In Maryland the number is approximately 85,000, or about one in 10. 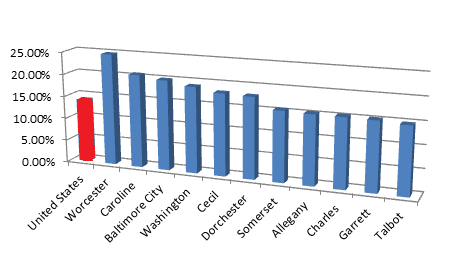 The jurisdictions experiencing the highest rates of disconnection among the total youth population are Baltimore City and Caroline, Cecil, Dorchester, Washington, and Worcester Counties. Five Maryland jurisdictions with largest number of disconnected youth. Years of research has demonstrated that reconnecting youth is beyond the scope of a single program. Young people need multiple pathways that combine work experience, education, training, and other supports. These pathways may include drop out recovery programs, early college/dual track programs, nontraditional certificate or associate degree programs, leading edge internships or apprenticeships, training directly linked with job placement, two generation approaches involving healthy child development with parental career development, life skills training, and supported independent living opportunities. Maryland jurisdictions with rates of youth disconnection higher than the national average. An overarching gap or challenge the Governor’s Office for Children is working to address is in improving and streamlining communication between Agencies that provide layered services to children, youth, and families. Sharing of information across Agencies (especially for those Agencies providing entitlement services) remains problematic for effectively engaging with this population. In addition, the Governor’s Office for Children and the Children’s Cabinet have identified a number of additional barriers to reconnection and strategies that may help the State better serve this vulnerable population. For more information on additional challenges identified by the Governor’s Office for Children and the Children’s Cabinet, and for a more detailed explanation of how Maryland is working to reconnect youth, please refer to the Children’s Cabinet Strategic Direction and Implementation Plan. Governor’s Office for Children, “Disconnection by Jurisdiction.” Updated October 2015. Available online at http://goc.maryland.gov/presentations/. Measure of America. 2015 Opportunity Index by County. Available online at opportunityindex.org.